The flower bug bit me, and I am spending so much time outside now, playing in my raised veggie beds and planting more and more flowers. 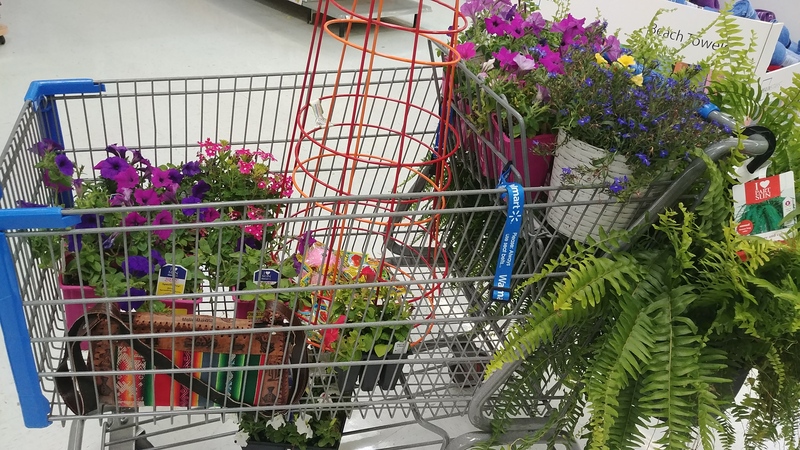 Wal-Mart marked their Wave Petunias down to 95 cents per pot. I also found a big pack of 16 white petunias for $2.50 and a little six pack of red petunias for 50 cents so I bought tons of those. I bought some hanging baskets secondhand (still had the price tags on them!) 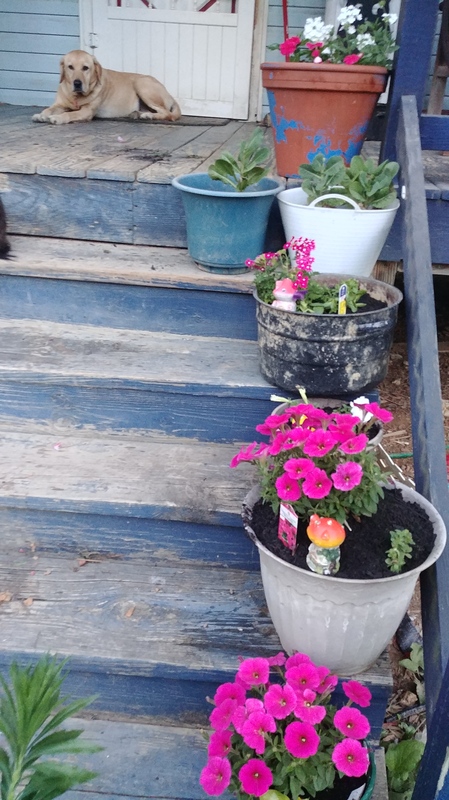 and dug out the old flowerboxes from under the porch and started planting. Thst look small, but once they fill out, they’ll be awesome! I repotted one of the Supertunia plants into a much bigger pot, and I’ll have to repot the other one as well once I find a larger pot. They’re root bound! 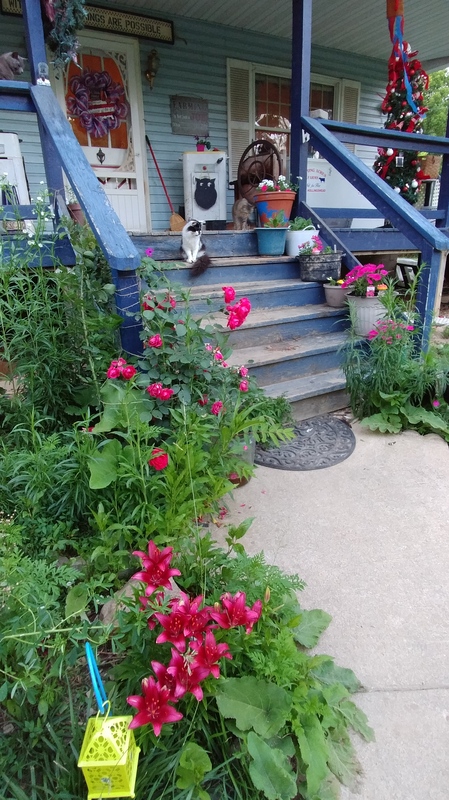 These are gorgeous, vigorously growing flowers; I wish I’d purchased more when I got these two because I just love how easy they are to care for – water daily and pick off the fading blooms and give them full sun, and they get HUGE! Unfortunately, I can’t find any more. 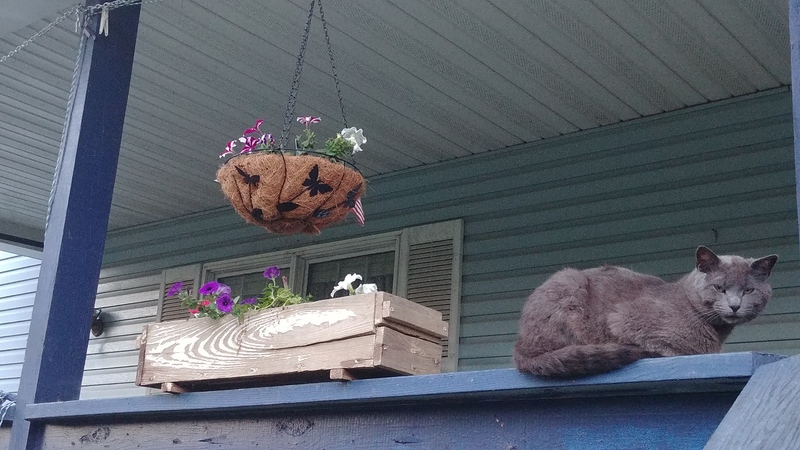 I dug out two old graniteware canners I picked up at the flea market last year and potted some flowers in those. 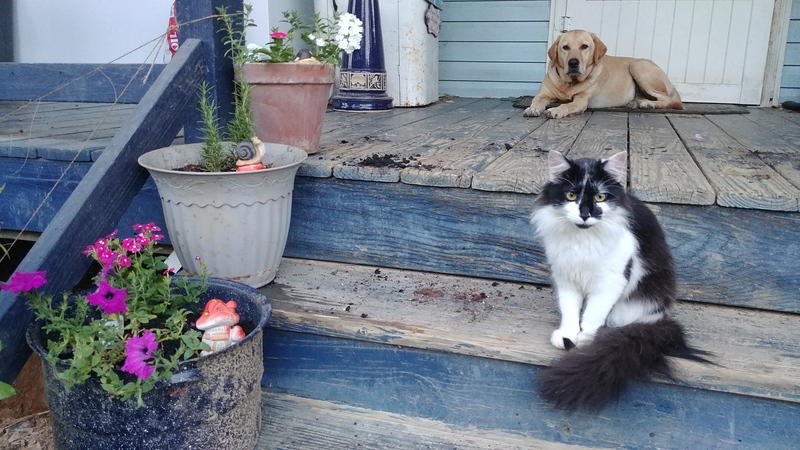 They look so shabby chic on the faded painted porch steps! This is the view as I round the sidewalk to the steps. The lilies and wildflowers and roses are blooming, and I have a nice patriotic wreath on the door. Yes, that’s a Christmas tree, fully decorated, on my front porch; I got it at a yard sale for $7 and had to set it out to dry because it got heavily rained on in the back of the pickup truck. 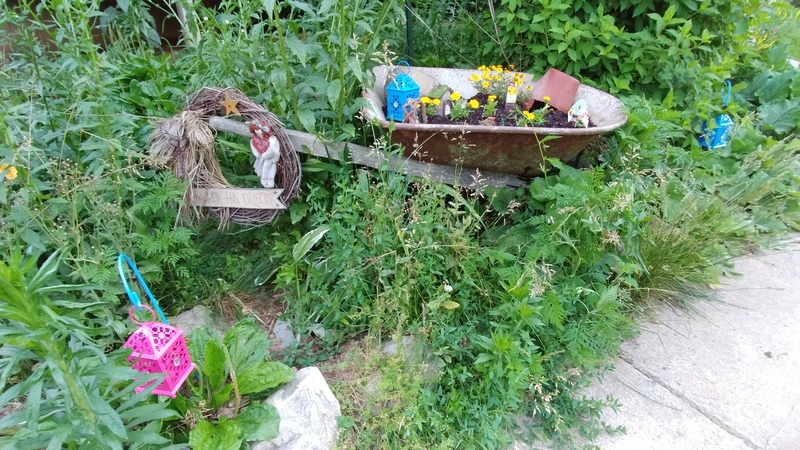 This is my gnome garden in an old wheelbarrow! 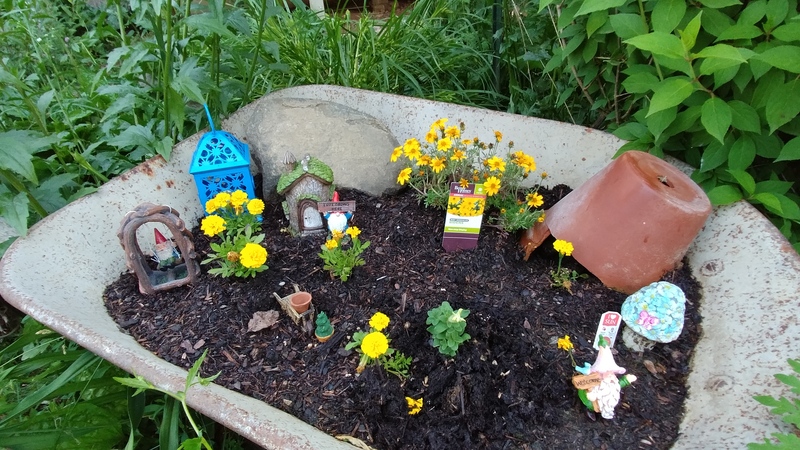 I have always loved gnomes and decided to do this instead of a fairy garden. Here’s a close up. I had a pretty pink flower in the front, but the wheelbarrow had no drainage so it got waterlogged and died. I pulled it out and replaced it with a clearance rack petunia. I have no idea what color of flowers it will have. LOL I’m excited to find out though! Ted drilled a hole in the bottom so nothing else dies from too much water. I am thoroughly enjoying this summer!